Prime Minister Narendra Modi has carried out some significant economic and governance reforms after coming to power last year, but needs to do more, top American CEOs have said in New York after meeting him. 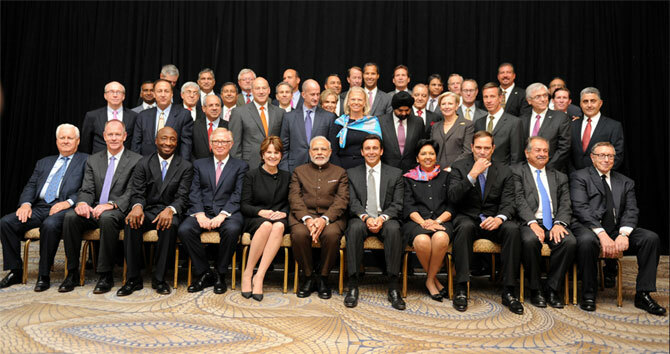 Kicking off his second visit to the US in one year with a meeting with eight of the top 10 financial entities in the US, including JP Morgan and Blackstone, Modi outlined efforts made during the last 15 months to increase investment in key areas like infrastructure. Some of the CEOs, after Thursday’s meeting, said they were satisfied with the progress of the reform. "The government has already undertaken a massive amount of reforms. Key message from the US companies was keep doing what you are doing. I had a great meeting, there was a constructive dialogue in the spirit of collaboration. We are looking at India trying to get foreign direct investment," J P Morgan CEO James Dimon said. "Our goal is to make sure that we are seeing enough change so that we feel we are comfortable in investing our capital. We would continue to watch and wait. For the amount of time he has been in office, there has been a lot of changes he has made. So clearly more to come, but as a potential investor, we are optimist," said Vicki Fuller of New York State Common Retirement Fund after her meeting with Modi. When asked if she is satisfied with the pace of economic reforms in India, Fuller replied in positive, "Yes I am." Black Stone CEO Stephen A Schwarzman said that he felt the Prime Minister was open to the suggestions the CEOs put before him to improve access to the country. "There are various, in terms of ability of US companies to take IPOs, the ability to have more capital going to rural areas," he said when asked on the kind of reforms US companies would like to have in India. "I think, things tend to overshoot. People tend to get exceptionally excited. I am hopeful as is everyone that things would be on track," Schwarzman said.